Though a lot of movies claim to have it all, The Lost Boys truly is the whole package. A charming marriage of humor and horror, this cult gem kicks off like a runaway rail cart, and maintains a breakneck pace for the duration of its 93-minute runtime, relying on a well-balanced blend of witty banter and stomach-turning gore to stay afloat where other vampire movies flounder. The acting is top notch right down the line, making even minor characters memorable, while smart dialogue adds a welcome amount of giggles amidst the bloodshed. If this in itself wasn’t enough, the mullets in this film are both plentiful and breathtaking, flowing majestically in time with one of the most righteous soundtracks of the ’80s. Apart from being a lot of fun, this movie also comes with a healthy dose of artful carnage, which never arises at the expense of storytelling. Ever wonder if a stereo system could make your head explode? Curious as to what would happen if an undead monster dissolved alive in your bathtub? Have you lost sleep thinking, “Man, wouldn’t it be awesome to see Jack Bauer bite into a bald man’s skull?” If you answered yes to any of these questions, then The Lost Boys is absolutely for you. Remember, “when a vampire bites it, it’s never a pretty sight,” and though this may be true, I promise, it’s infinitely entertaining. 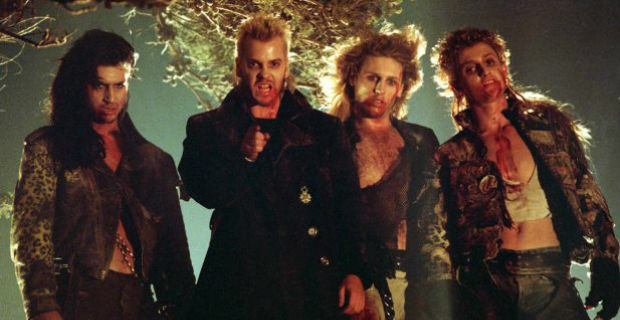 Over the past few years, cinema bloodsuckers have slowly been transformed from horrific killers into teenage heartthrobs, so this Halloween, curl up with The Lost Boys and reminisce on the glory days when they were both.